For many towns and cities in the past, the local department stores were always bustling with customers, but sadly in modern times these commercial emporiums are fast becoming a rarity for local shoppers. In this feature we celebrate the department stores that used to draw throngs of customers to town. This photograph of Gravesend shows a feature that has now vanished from its town centre – the British Home Stores department store that closed in 2016. 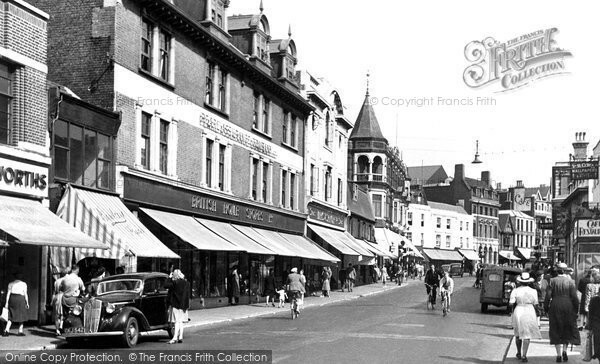 Photo: Gravesend, New Road c.1955. I remember very fondly Woolwich market & town centre in the 60's & 70's. Cuffs department store always seemed so imposing with polished wooden floors, we had to go there to get my school uniform for Notre Dame Convent in Eglington Road. Christmas time always meant a visit to the store to see Santa's grotto, and a ride up in the lift which was always manned. My favourite department was the downstairs jewellery dept, (still love a bit of bling now) it had a wood and glass case which revolved round and you pressed a button to stop it at your favourite item. Mum used to treat herself and have her hair done there too. 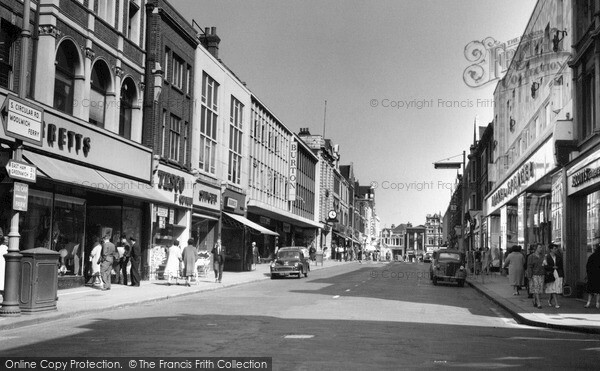 Photo: Woolwich, Powis Street 1962. 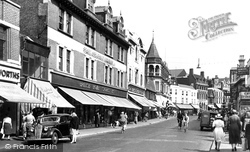 Clemersons, Loughborough’s one and only department store in 1949, had started in the mid 19th century as an ironmongers. 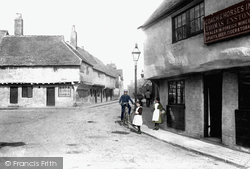 It grew both in physical size - occupying a rabbit warren of connected shops on the corner of Cattle Market and Market Street - and in its range of goods. Furniture sales (as well as storage and removals), glass, carpets, china and toys were all part of Clemersons’ stock-in-trade. 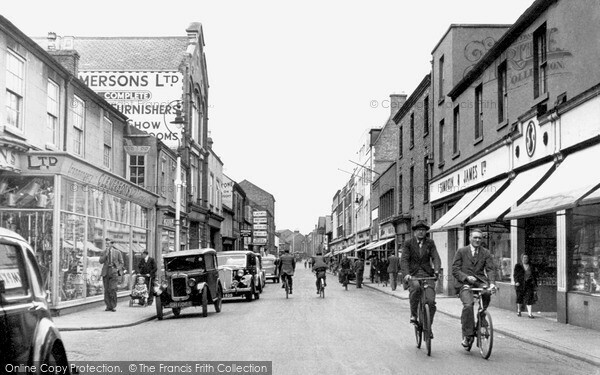 Photo: Loughborough, Market Street 1949. 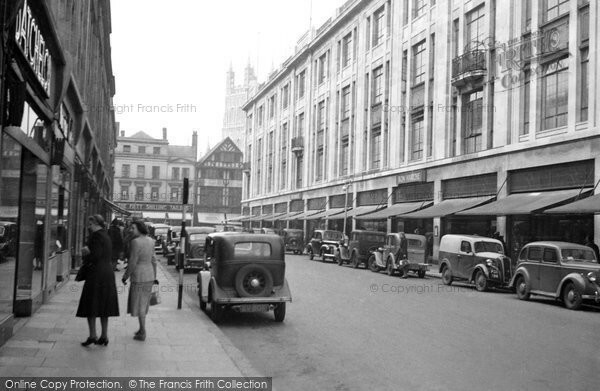 On the right of this photograph is the department store Bon Marché, filmed from outside the post office. During the Second World War, part of the store was taken over by the American forces and many a date was arranged, to meet under the clock on the far corner. I remember queuing most Saturdays outside to buy currant bread for a treat for Sunday tea, also nylons which were like gold dust. On the opposite side was the up market store Dentons. Photo: Gloucester, The Oxbode 1949. Many people of a certain age who lived in Croydon in their youth will have very fond memories of the Kennard’s department store. 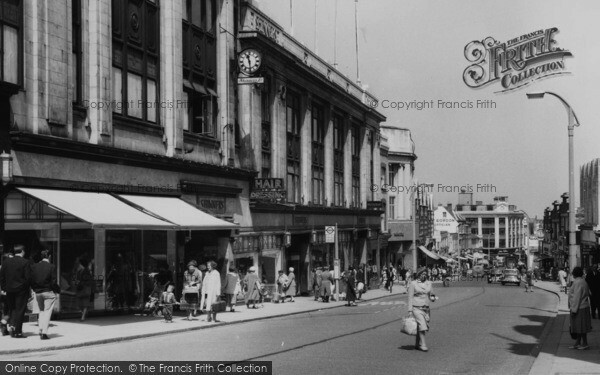 The first stretch of North End in Croydon used to be dominated by two department stores, Kennard’s and Allders. Kennard’s, on the left of photograph C201039, was demolished to make way for the Drummond Centre, a shopping centre and a Debenhams store. The rooftop of Kennard’s was used for children’s activities and was known as the ‘Playground in the Sky’. To encourage customers to visit, the store even had its own zoo in the 1950s; this mainly consisted of different monkeys in cages and parrots and pet animals such as rabbits and guinea pigs, but there was also a whale on display at one time. The Kennard’s department store was renowned for its extravagant and bizarre selling techniques to pull in the customers; the store’s manager Robert Driscoll would have chimpanzees dressed in suits and other circus animals on display to entertain and promote the goods. One of his publicity stunts to advertise a ‘jumbo sale’ was to have two elephants at each side of North End to attract customers’ attention, which caused chaos by blocking the passage of the trams. Photo: Croydon, North End c.1955. If you enlarge this picture you can see the letter ERS on the white building behind St Margarets. This was Suters, a family owned department store, built very much in the art deco style and the retail flagship of Uxbridge High Street. As a small boy all my clothes were purchased there. Shoes too. Purchasing shoes then was not the casual shelf-browsing do-it-yourself process that it is now. You described what you wanted and the assistant would bring out a selection. When you found what you wanted your foot was placed on a sliding measure to find the correct size. To make doubly sure the fit was correct they had an x-ray machine in which you placed your feet and peered through a binocular-like viewer. So you saw the bones and everything. The health authorities of today would have had a blue fit!! My aunt had a Saturday job there on the haberdashery counter. Her particular responsibility being gloves and handkerchieves. Gloves were then a must-have even in the summer when no smart young lady was without a pair of white lacey gloves with a frill around the wrist for Sunday best. Linen handkerchiefs, large for men and ridiculously small and impractical for ladies were also much purchased items in these days before tissues became common. There were no cash registers on the counters. There was a system of pneumatic pipes leading from each counter or department to the central register. The assistant wrote the article number and price on slip and this together with the payment was placed in a metal canister which was again placed in a slot in the tube. A button was pressed which sent the canister wooshing across the pipes under the ceiling to the central office. After a couple of minutes another woosh and clatter announced the return of the canister with the customers receipt and change. Call me old fashioned if you like but I still think think this was a genial invention as it relieved the floor assistant from time consuming responsibilities of balancing the till at the end of the day and at the same time was a security for the management against dishonest employees. It was also time efficient as they could start serving the next customer while the canister was being processed. 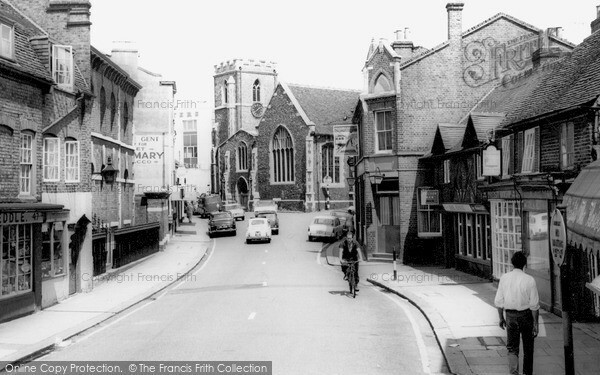 Photo: Uxbridge, Windsor Street c.1965. After leaving school my first job was in Cuffs department store on the counter selling scarves and gloves. I was a very shy girl but a lovely lady named Tessa took me under her wing and we became friends. She was older than me and had a really good sense of humour - I often wonder what became of her. My next position was opposite Cuffs working as a window dresser (this is what I had always wanted to do) for Richard Shops, a well known chain of stores selling ladies fashion. There were quite a few of us girls working there and the two I remember most were June Mckay and Jean Loveday. The railway ran behind the premises and in the summer we would sit outside, eat our lunch and wave to passengers - our lunch more often than not would be chips from 'the hole in the wall' - a tiny shop set back in the brickwork of the railway. We used to have such a laugh there, especially in the workroom where alterations to clothes were carried out by two lady dressmakers who were always called by their surnames - Harty and Spicey. Harty was a gentle soul but Spicey was scary and didn't stand any nonsense. When the shop had sales, items would constantly be reduced in price until they were sold and us girls could have first pick. I have very fond memories of Bearman's and the Christmas Wonderland ride is still very vivid in my mind 50 odd years later. My grandmother took me there to buy bridesmaid headdresses for my ballet classes and I was fascinated by the cartons containing money from the tills, whizzing overhead to a small kiosk where it was collected. I always felt sorry for the people in the kiosks as they were stuck in a small space on their own, missing out on the hustle and bustle of the store. My grandmother had an account there so we only seemed to go on Blue Cross days and Christmas! Happy days! Bearmans was the big department store on the site which is now occupied by the Coop or Leo's. I remember the toy department at Christmas was fantastic with an enormous model train layout in the centre of the floor which would take you ages to walk right round, everything painstakingly assembled in miniature for the kiddies. I remember visiting Santa at Christmas. To get to Santa's grotto, you went on a sleigh ride with plywood cut out reindeers on either side of the seats. The ride had some machinery to make it feel like a real sleigh ride. Bearmans sold Ladybird clothes and Clarkes' shoes for children and had child mannequins in the front windows. 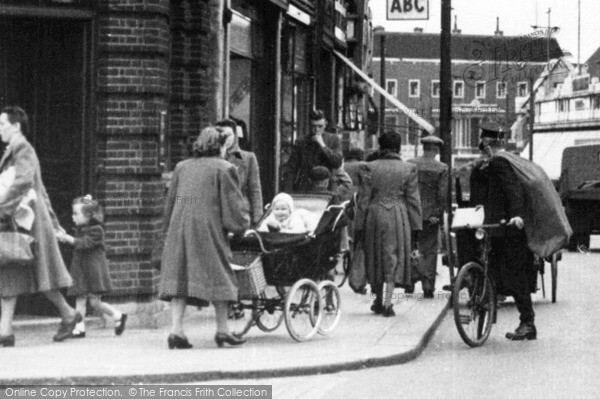 Photo: Leytonstone, People, High Road c.1950. I had a Saturday job at Harveys and I was paid £1 for the day. It would have been about 1964-65. I remember working in the toy department one Christmas and loving it; so much easier than the paper round on the Sunday. Harvey's had creaking floorboards under heavy carpets and still had Pneumatic Tube Transport for sending money and receiving change in a cylindrical tube. 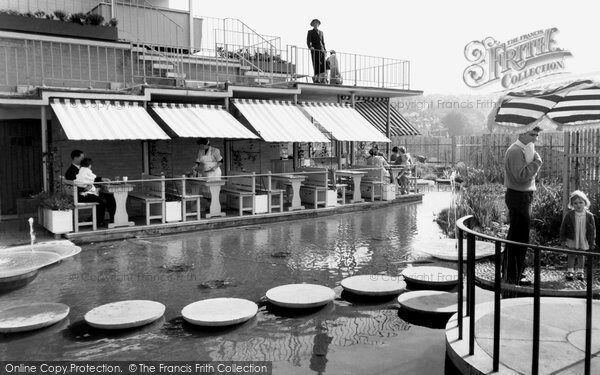 Photo: Guildford, The Roof Garden c.1960. My mother worked in Lloyds in Holton Road. They had two shops, one which she usually worked in selling Lino, beds and furniture, and china etc. The other shop was the largest of the two and my mother used to shop there a lot. Entering this building on the right hand side was the men clothes, on the left hand side was a beautiful staircase built with lovely mahogany wood. Beside these stairs on the left, ladies underwear was on sale and towards the back of the shop ladies clothing would have been on display. Upstairs as you turned right, was the coats and dresses department, and up some more stairs took you into the hat department where hats of all colours were displayed on stands. Near the back of the shop shoes were on sale. The counters were glass and had matching shelves and items of clothing was laid out on these counters where customers could examine goods before buying them. The fascinating thing about the shop was the little capsule which sales assistants dropped the bill and money from a sale in. It was sucked up as if by magic into an upper office and the change and receipt returned the same way. Does anyone remember Johnson & Clarks department store? It used to be the place to go for school uniforms. It was like Grace Brother's department store from the comedy TV show "Are you being served?". I tried to find some old photos, but to no avail. Before it was demolished, it sat on the opposite corner from where Debenhams still sits. Strangely, this is one of my oldest memories of Staines along with the big old cinema watching Star Wars, ET etc... The legendary queues to get into the cinema almost wrapped right around the building. Overlooked by the then newly-built Plaza Hotel, Piccadilly Square in Manchester is a main focus in the city and incorporates a bus terminal and garden area. 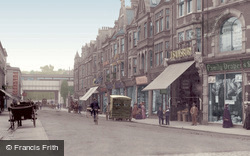 Lewis’s developed during the late 19th century, and at one time was the largest departmental store outside London. Paulden’s store opened in the 1950s; the building had been constructed in 1932 as a warehouse. 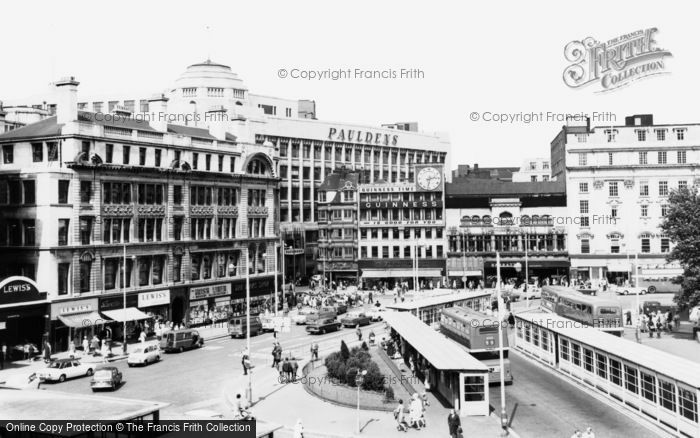 Photo: Manchester, Market Street And Piccadilly Junction c.1965. 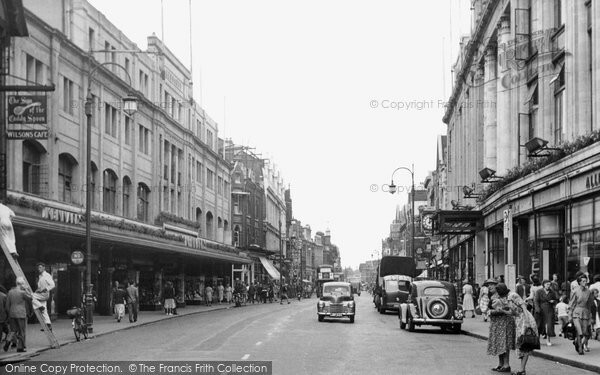 Photo: Sutton, Shinners Department Store, High Street c.1960. If you liked our "Department Stores" Blog Feature, you might like to see and follow this Francis Frith board over on Pinterest. This post has the following tags: Memories,Nostalgia.